If it were possible to establish a means of communication between the Nineteenth and Twenty-First Centuries, perhaps no one would be more surprised than the composer himself to learn that in today’s musical circles Charles Gounod’s reputation rests almost solely upon the popularity of his operas Faust and Roméo et Juliette. From the well-received first production of Sapho in 1851 until the unsuccessful première of Le tribut de Zamora in 1881, Gounod was a dominant figure in French opera, enriching the repertory with scores as lovely but largely ignored as La colombe, La reine de Saba, and Mireille. With many new operas now devoid of anything that might be mistaken for a memorable melody, the crime for which Gounod’s reputation has been doomed to derogation can be reasonably identified as tunefulness in the first degree. Even at the height of Gounod’s fame, dissenting voices alleged that the melodies of Faust and Roméo et Juliette, though undeniably pretty, failed to parallel the literary significance of Goethe’s and Shakespeare’s scenarios, but what accounts for the reversal of fortune whereby a pair of scores maligned for euphonious vapidity are now the two of his operas to be accepted into the international repertory? Superbly recorded in concert by Ediciones Singulares in Munich in January 2015, this performance of Gounod’s Cinq-Mars offers a new perspective on Gounod’s frequently misunderstood and misrepresented artistry, vastly different from the Romantic vistas of Faust and Roméo et Juliette. If melodic beauty and bounty are indeed damnable offenses, Gounod could hope for nothing other than condemnation, but this recording of Cinq-Mars makes an eloquent argument for commuting the composer’s sentence to one of eternal enjoyment in the world’s opera houses. Premièred at Paris’s storied Opéra-Comique on 5 April 1877, Cinq-Mars is Gounod’s setting of Alfred de Vigny’s fictionalized episodes from the life of the Seventeenth-Century courtesan Marion Delorme, familiar as the title heroine of a play by Victor Hugo and operas by Giovanni Bottesini and Amilcare Ponchielli—familiar, that is, if an observer is aware of Hugo’s drama and Bottesini’s and Ponchielli’s operas. The opera’s largely disappointing first production was conducted by Charles Lamoureaux, who also planned and presided over the first performances in France of Wagner’s Lohengrin and Tristan und Isolde. There are few vestiges in Cinq-Mars of Wagner, whose Der Ring des Nibelungen was performed in full for the first time eight months before the première of Gounod’s opera, but the ears also search in vain for the unabashed lyricism of Faust and Roméo et Juliette. 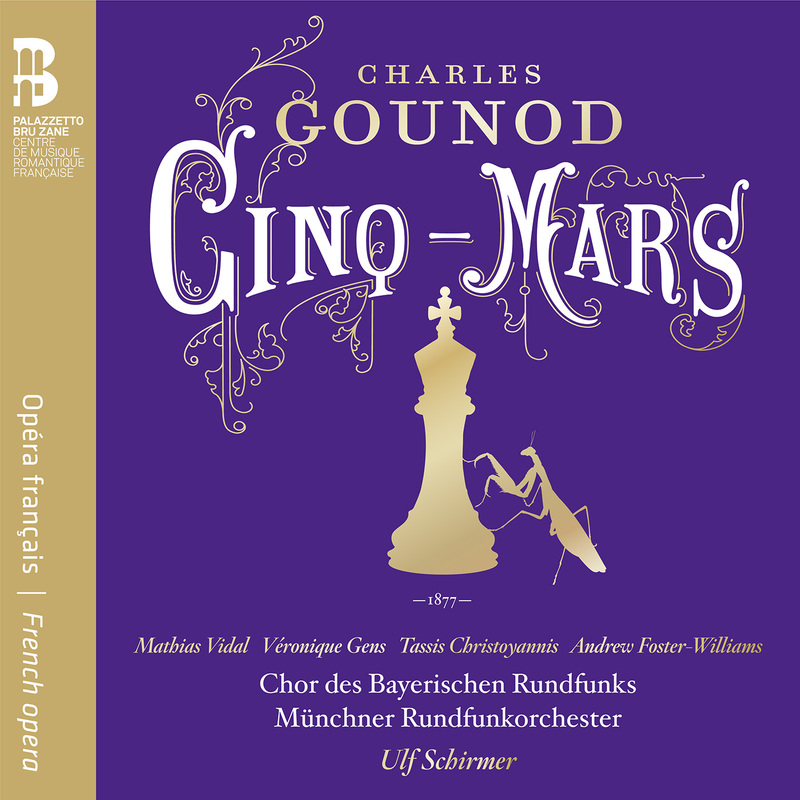 His imagination undoubtedly stoked by events from the history of his own country, Gounod composed a score for Cinq-Mars that is in some ways unlike any of his other extant operas. If Wagner is largely absent from the music, the grandeur of Beethoven and kinetic energy of Boieldieu are present, and the set pieces recall Meyerbeer and Halévy. The spirit of Verdi drifts northward over the Alps, as well, the Council Chamber Scene in Simon Boccanegra finding cousins in the elaborate ensembles in Gounod’s score, and with its idealistic tenor hero, put-upon soprano heroine, and menacing low-voiced representative of political intrigue, Cinq-Mars anticipates Giordano’s Andrea Chénier. The historical setting of Seventeenth-Century France inspired Gounod to create music that is aptly opulent without ever being pompous. Though unlikely to ever garner the widespread exposure of Faust, Cinq-Mars is a stirring, tautly-constructed work that, experienced via a performance of the quality of this one, expands the appreciation of Gounod’s theatrical flair. A pupil of György Ligeti, Christoph von Dohnányi, and Horst Stein and once an assistant to Lorin Maazel, German conductor Ulf Schirmer has proved through performances and recordings to be an insightful, often enthralling exponent of the operas of Richard Strauss and repertory of the Twentieth and Twenty-First Centuries. Here leading the excellent Chor des Bayerischen Rundfunks and Münchner Rundfunkorchester, of which ensemble his tenure as Principal Conductor is scheduled to expire at the end of the 2016 – 2017 Season, Schirmer approaches Cinq-Mars with beneficial Teutonic discipline that does not inhibit the Gallic refinement of Gounod’s music. The conductor shrinks from neither extremes of dynamics nor forging ahead according to the dictates of the score, but his tempi do not rush the soloists, choristers, or musicians. The dramatic sweep of the opera is evident even in its most lyrical passages, and the Münchner Rundfunkorchester’s strong, stylish playing, not least of the well-crafted Prélude, reflects the considerable advantages of the musicians’ long-established relationship with Schirmer. The choral singing, prepared by Stellario Fagone under the direction of chorus mistress Eva Pons, further enhances the resoundingly positive impression made by Schirmer’s conducting. If there is a ‘Gounod school’ of conducting fostered by decades of communal acquaintance with Faust and Roméo et Juliette, successfully pacing a performance of Cinq-Mars often violates its teachings. The methodology that Schirmer employs in this performance of Cinq-Mars is very simple: follow where the score leads. The score leads Schirmer to the realization of a compelling account of this fascinating music. The ensemble of vocalists assembled for supporting rôles in this performance of Cinq-Mars should provide every listener who complains about today’s alleged lack of truly capable singers with encouraging proof to the contrary. Cameroon-born bass Jacques-Greg Belobo as Le Roi and Le Chancelier, American tenor Andrew Lepri Meyer as De Montmort and L’Ambassadeur, German bass Matthias Ettmayr as De Montrésor and Eustache, and German bass-baritone Wolfgang Klose as De Brienne all sing handsomely, and their French diction is uniformly respectable. Moreover, whether singing ten notes or ten pages, they fashion vivid character studies from the music that Gounod gave them. The presence of French mezzo-soprano Marie Lenormand as Ninon de L’Enclos and Un berger is as successful an instance of luxury casting as has graced any recording. Lenormamd shines without pretentiously making star turns of her appearances. A well-schooled, alluring instrument, her voice is used with feline grace: no matter what obstacles Gounod placed in her path, she unfailingly lands on her musical feet. Following an opening scene in which the choristers’ singing of ‘A la cour vous allez paraître’ earns admiration for its animation and meticulously-balanced ensemble, the opera’s titular protagonist and his devoted friend de Thou, sung by French tenor Mathias Vidal and Greek baritone Tassis Christoyannis, propel the action of Act One and introduce themselves in a charismatic, perhaps slightly overlong duet, ‘Henri, vous nous parliez là d’une voix légère.’ Both gentlemen sing shrewdly, the baritone’s depiction of de Thou’s initial hesitation and concern giving way to hearty, effortlessly-vocalized camaraderie. Here and throughout the performance, Vidal proves an aptly noble figure, Cinq-Mars’s actions dictated by both conscience and decorum. Christoyannis’s de Thou is in many ways his foil, but the baritone’s attractive, inviolably secure vocalism lends his every utterance an inherent dignity that renders the character a particularly efficacious second to Cinq-Mars. Their conversation is framed by another stirring performance by the chorus, their singing of ‘Allez, par la nuit claire’ a delectable evocation of the untroubled night of which they sing. As he portrays Gounod’s saturnine Père Joseph in this performance of Cinq-Mars with a voice of thunderous authority, it is no surprise that British bass-baritone Andrew Foster-Williams was thrillingly potent as Donner and Gunther in Opera North’s recent traversals of Wagner’s Der Ring des Nibelungen. His characterization of Père Joseph is positively reptilian: one can virtually see the sadistic smirk of this cassocked crocodile. His manipulative, suggestive interjections in Act One are ever so polite, his cautious avoidance of showing his hand in the nation-making card game between his employer, Cardinal de Richelieu, and King Louis XIII cloaked in feigned deference to the royal prerogative: the blood ultimately on this Père Joseph’s hands glows almost as ruddily as l’Éminence rouge himself. From his first notes in this performance, it is apparent that Foster-Williams’s voice is an instrument groomed for greatness, one in which the great Verdi baritone rôles meet Wagner’s Holländer and Wotan. The inky smoothness of his singing of Père Joseph’s music is unnerving, the beauty and steadiness of his voice making the character’s malevolence all the more chilling. In Marie’s recitative ‘Par quel trouble profond suis-je ici ramenée’ and moody cavatine ‘Nuit resplendissante et silencieuse,’ soprano Véronique Gens, one of France’s most beguiling and hardest-working singers, encounters music that might have been composed especially for the purpose of exploiting her musical and histrionic strengths. The linguistic clarity of Gens’s declamation of the recitative is invigorating, but it is the poise of her singing of the cavatine, its G5 effortlessly projected, that captivates. With a wealth of experience in French Baroque music to her credit, Gens is uniquely qualified to approach Marie’s music with complete cognizance of its historical and artistic contexts, and she puts that qualification to meaningful use with a characterization of the conflicted pawn in factional maneuvering that throbs with feeling without violating the circumspect demeanor of a grand lady of Seventeenth-Century French society. Act One concludes with a duet for Cinq-Mars and Marie, ‘Ah! vous m’avez pardonné ma folie,’ that is one of the score’s most frustrating numbers. Though very capably written for the voices, the music sounds comfortable rather than impassioned. Vidal and Gens sing commandingly, however, elevating the emotional temperature of the scene. Like his duet partner, Vidal is no stranger to Baroque repertory, and he shares Gens’s innate sense for maintaining vocal posture appropriate to the scale of the music. The foundations of Rameau, Dauvergne, and Gluck support the opulent structures of Gounod’s music, and the familiarity with French idioms of previous generations that Gens and Vidal wield gives their singing of Marie’s and Cinq-Mars’s scenes an element of legitimacy that palpably communicates the characters’ emotions; more powerfully, in truth, than Gounod’s music manages to do on its own in some passages. The chorus and scene that begin Act Two. ‘A Marion, reine des belles,’ are performed incisively, and baritone André Heyboer gives a masterful account of Fontrailles’s chanson ‘On ne verra plus dans Paris tant de plumes ni de moustaches,’ his voice flowing through the music like the serpentine currents of the Seine. As performed here, Mélodrame that follows has the narrative thrust of radio drama, and the choristers bring energizing focus to ‘Ah! monsieur le grand écuyer, permettez que l’on vous salue.’ Vidal sings Cinq-Mars’s cavatine ‘Marie, ah! c’est la fin de notre longue attente’ romantically, his articulation of ‘Quand vous m’avez dit un jour’ shaped by the singer’s meticulous attention to both note and word values. In their trio, ‘Cet homme encore! Parlez,’ Gens’s Marie, Vidal’s Cinq-Mars, and Foster-Williams’s Père Joseph generate dramatic sparks that bring to mind the frenzied atmosphere of the final trio in Faust, the unison top B for the lovers rousingly projected as a counterattack against Père Joseph’s growling musical assault. The chorus and Heyboer’s sonorous Fontrailles set the mood for Act Two’s second tableau with their intense ‘Ninon, dites-nous, je vous en supplie,’ introducing the fiery Ninon with perfectly-controlled but appropriately imploring ensemble. Sparkling like a priceless jewel against the dark backdrop of the drama is the Marion of French soprano Norma Nahoun, whose singing of the air ‘Bergers, qui le voulez connaître’ ignites the music with fearless handling of the its bravura flourishes to top A and B. The garnet-toned Lenormand phrases Le Berger’s sonnet ‘De vox traits, mon âme est navrée’ with the finesse expected of but so seldom heard from native speakers of French. Nahoun and the chorus deliver ‘Parmi les fougères’ with charm that contrasts markedly with the music that follows. The Conjuration that brings down the curtain on Act Two, ‘Viendra-t-il? Il viendra, Messieurs,’ is the most original scene in the score and one of Gounod’s most effective creations for the stage. The influence of Weber and Berlioz is apparent, but the musical language is exclusively Gounod’s. It is a language in which Schirmer and the cast of this performance of Cinq-Mars are fluent, and they collectively convey the genius of the Conjuration with extraordinary cogency. It is to the chorus that Gounod entrusted launching Act Three, and the singers here repay him with a bristling account of ‘La fanfare éveillée, sous la haute feuillée,’ their work again a model of intelligently-managed balances and communicativeness. The trio for Marie, Cinq-Mars, and de Thou, ‘Madame, c’est le lieu du rendez-vous,’ receives from Gens, Vidal, and Christoyannis a performance of pulse-quickening immediacy, their vocalism glowing with the electricity of the text. The subsequent Mélodrame provides a tense transition to the brooding ambience of the next scene. Foster-Williams intones Père Joseph’s air ‘Tu t’en vas confiant dans ta folle entreprise’ with accents borrowed from the mouth of hell and sounds that satisfy like the bliss of heaven. His stark singing of ‘Dans une trame invisible’ is a tour de force, the words hurled like javelins: rarely on disc or on stage does operatic villainy sound so sinfully, almost erotically bewitching. Joining Gens in the duet ‘Demeurez ici, Madame; il faut m’entendre,’ Foster-Williams reaffirms that his dramatic sensibilities are as impressive as his voice. He and Gens engage in musical combat with the unstinting force of Shakespeare’s Iago and Desdemona. The soprano’s tones occasionally harden when the voice comes under pressure, but her musicality—one of the foremost wonders of the operatic world—carries her safely through every challenge. Like Act Two’s Conjuration, the Hallali-Chœur that ends Act Three, ‘Hallali! chasse superbe, le cerf est couché sur l’herbe,’ is an innovative number that anticipates later works like Magnard’s Guercœur and even Poulenc’s Dialogues des Carmélites. Whereas the grand public scenes in Faust and Roméo et Juliette are constructed of layers of lyrical melody, the Hallali-Chœur is an imposingly bleak edifice upon which vignettes of lyric beauty are carved. Schirmer’s instinct for spotlighting the moments of dulcet expressivity without obscuring the boldness of Gounod’s writing is put to telling use. In this performance, the act ends zealously, singers and orchestra holding nothing back in the execution of their parts. Initiated with an aura of contemplation in ‘Ami, je faisais un beau rêve,’ Act Four moves quickly to its and the opera’s tragic dénouement. Vidal sings Cinq-Mars’s cavatine ‘C’est en vain que je veux pour jamais vous bannir’ beautifully, his imaginative phrasing highlighting nuances of both music and text. Occasionally, a voice with a stronger core—Alain Vanzo might have been an ideal Cinq-Mars, for instance—would likely make slightly greater impact in the music, but Vidal is a committed artist whose comfort with the style and tessitura of his music complements the assurance of his handling of his native language. Significantly, too, his seductively sweet-toned voice is evenly produced from bottom to top. In the duo with Marie, ‘Ah! qu’ai-je dit? Se peut-il que j’oublie,’ Vidal and Gens caress their lines, descending into great depths of emotion in their unaffected depiction of their characters’ desperate straits. Christoyannis adds his voice to theirs in ‘Amis, venez, plus de tristesse,’ and his singing resounds with contrasting steel and subtlety. Cinq-Mars and de Thou face Père Joseph one last time as they prepare for execution in the opera’s final scene. The cruel sentiments with which Gounod suffused ‘Messieurs, appelez à vous votre courage’ are heightened by the crackling voltage of Vidal’s, Christoyannis’s, and Foster-Williams’s vocal acting. Gens’s cry of despair as Cinq-Mars and de Thou unhesitatingly meet their deaths epitomizes the ethos of this performance: every sound serves the drama, and the drama is drawn organically from the music. Performance in concert form is a perfect medium for displaying the abundant merits of Cinq-Mars—and, as this wonderful Ediciones Singulares release attests, for recording the opera. Without the need for elaborate scenic effects and costumes, resources can be devoted to engaging artists of the caliber that Gounod’s score deserves. Cinq-Mars is a work that is by no means an inferior sibling to Faust and Roméo et Juliette, but a decent Faust or Roméo et Juliette can be assembled from less-than-top-quality parts. Enrico Caruso famously quipped that Verdi’s Il trovatore requires neither more nor less than the world’s four greatest singers. Cinq-Mars’s demands are not quite so incredible, but the opera’s success depends upon what it receives in this performance: knowledgeable conducting, dedicated music making, and first-rate singing. Many are the forgotten scores that could be delightfully resurrected by the quartet of Mathias Vidal, Véronique Gens, Tassis Christoyannis, and Andrew Foster-Williams. It is Gounod’s excellent fortune that they espoused his Cinq-Mars.